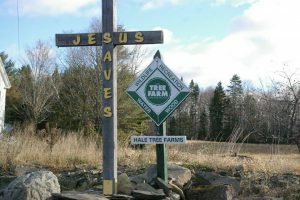 Hale Tree Farms has Choose & Cut hand-sheared, farm fresh Christmas trees in rural Westmanland, Maine. Call for off hours appointment. We sell Balsam fir Christmas trees and will wrap your family tree if weather or size requirements are met. In other words if you select a super large tree that will not go through our 26 inch baler, we may be unable to bale it. If it is extremely cold we may need to seek an alternative way to get your tree to you since cold may break branches (not good).